Alexander and Louis XIV. Tapestries in Glory of Louis XIV. Paris, Galerie des Gobelins, from 21 September 2008 to 1st March 2009. 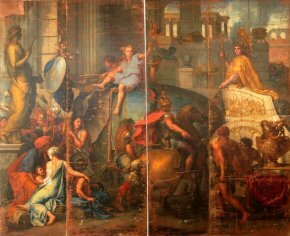 Generally, the large compositions of the History of Alexander by Charles Le Brun exhibited at the Louvre (and The Persian Queens at Alexander’s Feet at Versailles) are thought to be preparatory cartoons for tapestries. Actually, these paintings, which were first intended most probably for the décor of a gallery which was never built, were not directly the original source of the pieces woven at the Gobelins. The workshop of the Premier Peintre du Roi (the King’s First Painter) was instructed to execute two cartoons  based on each of these canvases, one on the right side for high warp, the other one backwards for low warp , enabling the artisans to produce the tapestries without damaging the original works. The exhibition which has recently opened in the new Gallery inaugurated last year, offers visitors the chance to discover for the first time one of these cartoons (ill. 1) next to the tapestry series. This is a veritable revelation : for the 17th century alone, the Gobelins holds at least 200 which were practically unknown until now to art historians. In extremely poor condition due to their use, these works are being progressively restored and placed on cylinders or on frames in the case of the most beautiful ones. However, this in no way takes away from the presentation here of the sumptuous tapestry series, The History of Alexander (ill. 2 and 3). Eight replicas were woven, four in high warp, three of which belong to the Mobilier National and one which was given in 1699 by Louis XIV to Duke Leopold of Lorraine (today in the Kuntshistorisches Museum) ; four in low warp, one of which is held at the Mobilier National, two which have disappeared and one for which only two elements are still known and are in a private collection. The tapestries exhibited here are from the high warp weavings belonging to the Mobilier National, selected among the best preserved ones in order to reconstitute a complete series of thirteen pieces . 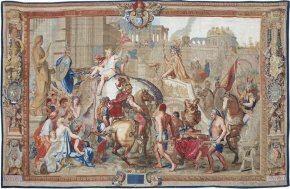 On the ground floor, three large painted silks (ill. 4) representing the battles of Louis XIV, after Le Brun, and Adam-Frans Van der Meulen, accompanied by three tapestries from the series of The History of the King provide comparative elements with the Alexander Tapestry Series. 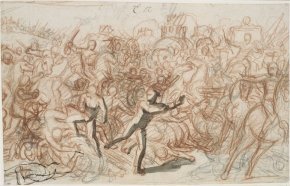 Preparatory drawings for the tapestries by Le Brun (ill. 5) and by Van der Meulen (his workshop holdings are preserved at the Mobilier National) as well as engravings round out the presentation. The exhibition is magnificently highlighted by period furniture and a few sculptures. The accompanying publication, although brief, is important in two respects : it corrects the facts on the history of the tapestry series and its different weavings and, above all, it instructs us for the first time on the remaining cartoons . Their authors are not always specifically identified but the names of René-Antoine Houasse, Henri Testelin, Guy-Louis Vernansal,…will probably arouse the close interest of amateurs of 17th century painting. 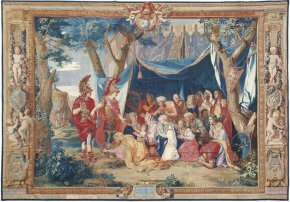 The catalogue recalls the origins of this series and its place in tapestry history, underlining especially its debt to The History of Scipio by Giulio Romano and also Pietro da Cortone and Jacob Jordaens who produced a History of Alexander woven in the Brussels workshops. 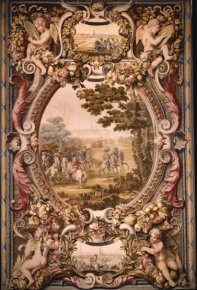 About 700 17th and 18th century tapestries, from approximately a hundred different series, make up the Mobilier National collections (to which one should add those from the 19th and particularly 20th century when the Gobelins underwent a veritable renaissance). This wealth guarantees an active exhibition policy for future programming, in conjunction with shows on furniture. Visitor Information : Paris, Galerie des Gobelins, 45, avenue des Gobelins, 75013 Paris. Phone : + 33 (0)1 44 08 53 49. Open daily except Monday 12.30 to 18.30. Rates : 6 and 4 €. Each cartoon is painted on three, four or five bands, or strips, measuring about 3.20 by 1.20 cm. This makes the weaving easier. At times, only certain strips remain. However, exceptionally, some low warp cartoons are in the same direction as the original composition, meaning that the tapestry is thus inverted or backwards. The low warp tapestries had only 11 subjects, one even had just 7. Nonetheless, it is too bad that nothing is said about the works displayed for comparison, the tapestries from The History of the King, the very beautiful Savonnerie rug after Le Brun made for the Grande Galerie in the Louvre and especially the large painted silks resembling tapestries, little-known pieces produced with a very rare technique.